Cosmetic treatments are typically offered as a multi-treatment package and patients can choose from face, neck or abdominal procedures. If you are considering cosmetic acupuncture we suggest signing up for a free 30 minute consultation to find out if this type of treatment is right for you. Please call 512.451.5726 to schedule yours today. In general we see the most dramatic results with individuals who are just starting to notice the appearance of fine lines. While everyone’s skin is different the age range for optimal results is usually late 30s to mid-50s. Because cosmetic treatments tend to bring collagen and nutrient-rich blood to the skin, individuals of all ages may experience a more glowing, youthful appearance as a result of the Mei Zen system. With the understanding that looking great and feeling great go hand in hand, your sessions will include nutritional advice and recommendations for supplementation to enhance your overall results. Read our blog post, “Botox in a Box,” for more on this topic. How many sessions of cosmetic acupuncture will I need before I start to see results? 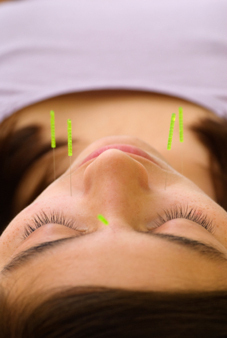 The effects of cosmetic acupuncture tend to accumulate over time. Most people will begin to see results within the first 3-5 treatments. How frequently do I need to come in for treatments? The recommended frequency for optimal results is 2 treatments per week for 5 weeks. A typical session takes about 90 minutes. Do I need to bring anything with me to the treatments? If you are planning on going out or back to work after your treatment it is recommended that you bring the makeup you like to wear, plus moisturizer, etc. with you. Your practitioner is highly trained in various techniques for reducing any discomfort you might experience during a treatment. In general, those who can tolerate waxing procedures or extractions done during a facial should have no problem. Will the treatments interfere with other skin rejuvenating products or procedures I might be using? Cosmetic acupuncture is NOT recommended for individuals who are currently receiving chemical peels or IPL, photofacial type treatments. How long will the results of a 10-treatment package last? Depending on your lifestyle (i.e. tendency to sun damage, diet, etc.) you should see lasting results for 6 months or so. Follow-up, “refresher” treatments are recommended once a month to help maintain a glowing, youthful skin appearance. Because cosmetic treatments involve special training, more hands-on time with the patient and several more needles than a regular treatment, they are priced at a different rate than a regular acupuncture session. Please call our office at (512) 451-5726 for the most current pricing.